We would like to congratulate Fighting Arts Academy CT’s “Notorious” Nick Newell, who was recently named the most successful professional Mixed Marital Arts (MMA) competitor to ever come out of CT! 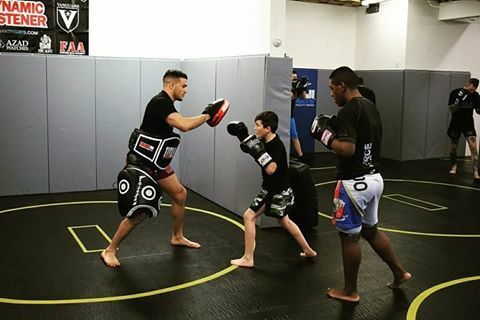 As one of the coaches at Fighting Arts Academy CT, Nick brings his knowledge in Mixed Martial Arts (MMA), Jiu-Jitsu, Kickboxing and Muay Thai to help teach and train at the training facility in West Haven CT. Ten of his wins have been in the first round. Nick brings his dedication and skill to train everyone at Fighting Arts Academy CT according to their individual goals. Whether it’s training to compete at the highest level, training to get in shape, learn self-defense or just to train kids, Nick provides FAA CT with the fun, supportive and encouraging environment that makes it clean, safe and the greatest training environment around West Haven, Orange, Milford, New Haven, Woodbridge and surrounding areas. Come stop by FAA CT in West Haven and congratulate Nick and check out the facility when you get the chance. All ages and fitness levels are encouraged, as we offer both beginner and advanced classes in our weekly schedule. Also, don’t forget to take advantage of our Free Trial! Nick Newell is a Professional Mixed Martial Arts Fighter, with a record of 13 wins & 1 defeat. Nick is Connecticut's only ever Mixed Martial Arts World Champion & one of the most successful martial arts competitors to ever come out of CT. Nick accomplished all these things despite being born with only one hand.